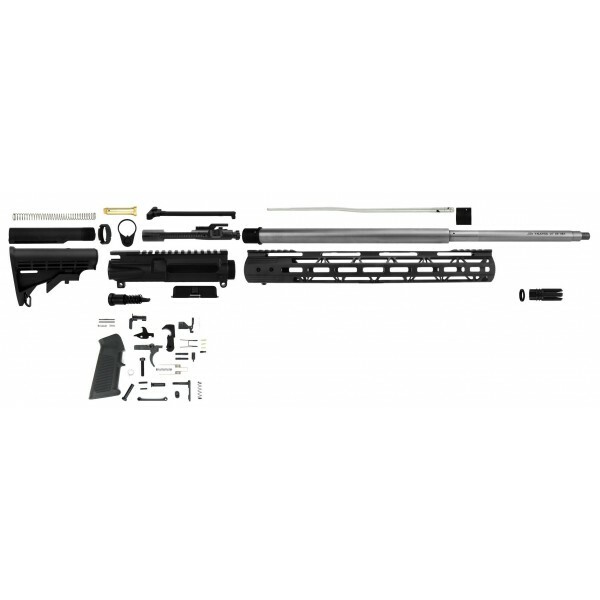 Moriarti Armaments AR-15 .224 Valkyrie 22″ stainless steel rifle kit comes complete with a MATCH GRADE Stainless Steel 416R Barrel, low profile Steel .750 Gas Block with Nitride Finish and a Stainless Steel Rifle Gas tube. Upper is finished off with a Free Float of your choice, Ultra Slim Line Keymod, MLOK Handguard or Quadrail with picatinny top rail. All components are mil spec and made in the USA. Barrel - 22” .224 Valkyrie Match Grade 416R Stainless Steel Barrel. .224 Valkyrie Match Grade 416R Stainless Steel Barrel Rifle Length Gas and 1:7 Twist. U.S. made and manufactured to MIL-SPEC specifications exceeding the ISO-9002 Quality Standard. Provided with a Limited Lifetime Manufacturer Warranty against defects. Gas system - low profile steel .750 gas block, black hardcoat anodized. Rifle length stainless steel gas tube. 6.8 SPC BCG. Nitride Coated, M16 cut. This kit comes unassembled. 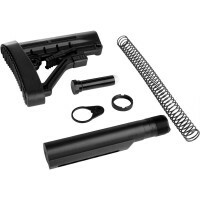 Includes everything you need to complete your AR-15 project, except AR-15 lower receiver. Can be purchased separately.